Wheatgrass is quickly gaining popularity as researches are revealing more and more health benefits that one can obtain from fresh wheatgrass juice. Wheatgrass juice is often called the “Liquid Sunshine” because of its very high content of chlorophyll. And chlorophyll is the green pigment that harnesses the sun’s energy. Wheatgrass is the young grass of the wheat plant and is harvested early when its nutrients and minerals contents are at its peak. For convenience, wheatgrass are now made into powder form and are being sold commercially. Barley grass is also being marketed commercially as a superfood, but between the two, wheatgrass is reported to contain a much higher level of vitamin E, selenium, phosphorus, manganese, chlorophyll, etc. This miracle grass also has a long list of amino acids—about 17 types of them and about 80 known enzymes. Read more about chlorophyll and the amazing similarity between the molecule structures of both chlorophyll and the human blood (hemoglobin). The best way to enjoy all the health benefits of this liquid sunshine is in the form of its fresh juice. One or two ounces a day is enough to provide you the energy to last the day, beats coffee anytime !! Antioxidant: The high antioxidant content helps neutralize free radicals and oxidation that find their way in the body. It helps reduce the harm caused by air pollutants like carbon monoxide or cigarette smoke. Tooth decay: Gargle wheatgrass juice to prevent tooth decay, relieve toothache, treat bleeding gums and control pyorrhea (infection and loosening of tooth sockets). Weight control: Because the nutrition in wheatgrass juice is so complete, it relieves your body of cravings, thus reducing the unnecessary need to overeat. Need we say more why you should add wheatgrass juice to your juicing diet? Wheatgrass is very fibrous and is indigestible for the human stomach. Which is why you need to juice it to get to its goodness. What does it taste like? Despite its 70% content of chlorophyll and it being a “grass”, wheatgrass juice doesn’t really taste like “grass” as what most would think. How to juice wheatgrass? Your best bet will be using a masticating juicer. I have tried using different juicers to extract the juice and found that when using the Green Power Kempo, the juice tastes nicely “greenish sweet”. It has a greenish taste yet it is sweet. 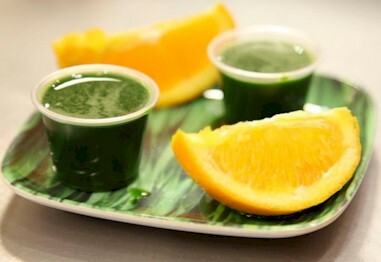 Wheatgrass juice is such a powerful cleanser that it may kick-start healing reactions almost immediately upon drinking. When toxins are being flushed and transported for elimination, it may cause nausea. Start with only a one-ounce shot a day and slowly work up according to your tolerance level, up to two ounces drunk two or three times a day. 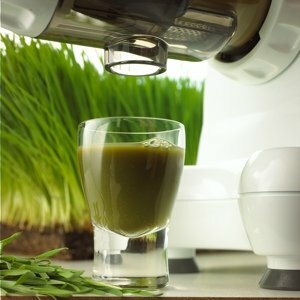 Wheatgrass can only be juiced using a gear juicer or a wheatgrass juicer. Learn how to grow/sprout your own wheatgrass at home. 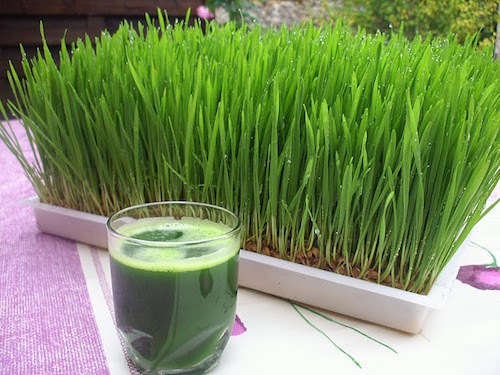 If you are allergic to wheat, start your wheatgrass juice regimen slowly, with one teaspoon a day. Even though wheatgrass juice does not contain gluten, it pays to be cautious. Discontinue if/when you face an allergic reaction.